I really like your blog- here in New Zealand our students don't have lunches provided like in UK but they can buy things from a tuckshop. In my school I'm really disappointed that we sell too much processed food and snacks high in sugar- and I'm a teacher! I hope our food providers read your blog and have a deep think!! I'm noticing more of a nutritional balance this week. I suspect your school canteen have taken notice of your blog! The reason the sausages are strangely textured is because they will have a high rusk content and low meat. This makes them pappy and soft and not very pleasant. Shame they can't spend some of your £2 on some decent bangers. I'm disturbed about the piece of hair! See now, I think that looks fine. *shrug* Particularly given that most schools would have free fruit at break. I think people have lost all sense of what constitutes an appropriate portion size, especially for children. One reasonable looking meal does not make a weeks food. Veg has taken a stand on the quality of the food she is offered and rightly so. I posted on Blogspot, Tumblr and Facebook about this, and I definitely support you! Can't believe they are trying to censor your writing from the Internet over there. You are a citizen journalist and you have the right to be heard. Keep it up!! keep going !!! yours is the first blog i have ever followed. Thank you! Veg reads the comments and likes hearing from Denmark as a friend lives there. We are surprised it made the newspapers in Denmark. It doesn't look too bad, but the portions still seem very small. I am still shocked by your post's. the food you get is very poor. Please take a look at my blog and if you can some how encourage others to look at it please. I am a chef in a private school so our pricing and food policy is a little different from your's but even so. I heard your interview, well done! I showed this photograph to my 4 year old, he said "that doesn't look very nice to me". So there you go. I'd never serve that up. And how do you feel about your plates with compartments, we don't eat like that in any other place...bring on proper plates! I'll ask my class if any of them want to add their school lunch to your collection! I must say that I love the 2nd appearance of three whole slices of cucumber. Or that a cheeky 4th slice hiding there? Keep up the good work. I've shared your blog with many friends since your 2nd post and they all think it's genius. I hope the recent improvement to the quality of the food you're getting remains and standards consistently improve. The TRUTH always wins in the end. My 2 years old son in the "Kindergarten" get´s better lunch than you. Perhaps the kitchen at your school is rather a fast food restaurant. I´m very sad about the state at your school! It woudn´t work here in germany. Greetings from Germany. Good Job. Keep on going. The Food seems to me a little sparse. *CAN'T! Not can... Schools CAN'T offer low quality meat or deep fry. Schools, together with parents and responsible authorities, should consider issuing contracts for school lunches to local food growers in order to ensure a local market for healthy foods. It's a shame that those rules don't apply in Scotland, it has its own government and so that makes the rules on school lunches in Scotland. You even made it in the German "Bildzeitung" (like "Sun" or so). Congrats, I like this Blog and I hope you can move things! I love your blog. I predict great things for you. Prime Minister one day perhaps? I just read about your blog in the german online newspaper "Bild". (quiet similar to your "Sun") So you already made it into the worlds papers. Congratulations for your blog. I guess these are the things that might change the world. Good luck and go on! even my two years old daughter eats more at lunch then you kids get ...how can u even learn with that weird food? I love your blog and recommend to everyone I know to read it. I look forward to reading it everyday when I'm at work. You're doing an interesting thing - and making it interesting. Son't get bored? Keep it up! Have you got a link to your radio interview you can blog, please? Would you lovely to hear you on the air! Has Scotland continued rationing food, thinking the war is still on? Please give this young woman a square meal! Keep up your blog, it's a good thing we get to see the reality of what's served up in schools! WOW! How many portions do they manage to extract from one carrot? Are you sure the hair you found was not actually a shred of something healthy? It makes my heart happy to see someone standing up and being counted when it comes to the cafeteria food in schools. I shudder when I see or read of what some children are being fed these days....and they call it food!!! Keep up the good work. 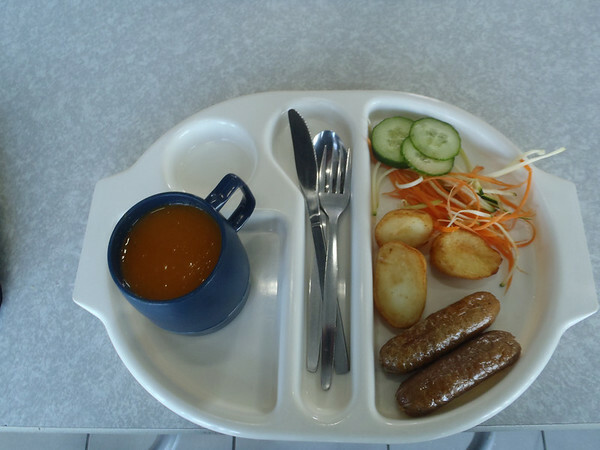 Your blog hopefully will help other children to speak up and demand healthy food choices from canteens at their schools. I LOVE that you are doing this blog! Maybe it will wake some people up. Keep going. Greetings from Florida, USA. Wonderful writing, Martha! Very witty, engaging, and informative! Keep on the good work, keeping the school lunch program accountable. And kudos to you and your parents for striving towards well-rounded meals. You have quite a sophisticated palate! You "little" blog is changing your community, and helping to nourish and develop the growing minds of your peers. What blessed work! I am Italian and leaving in Greenock. I am very impressed about your MANIFEST!!! That will be helpful for my 2 kids starting the primary school very soon. P.s. BTW just for your knowledge the Public School doesn't provide any food at all. are you really a 9 yr old? Liked your pictures very much. My niece was amazed to see that people ate from crockery just like the ones in India, and food layout looked similar too. She thought all England ate like come dine with me, or all western world cooked like master chef. here is Jamal. I live in Frankfurt am Main, Germany, and I am the founder of feinpad.de. I think it's super awesome what you do and I hope many other children around the world will do the same thing as you: say no, not with us! Your pictures reminded me of an internet site I've seen years ago. Jamie is right, keep on going! And hopefully start having your own lunch box every day. Hey, your blog has a very good theme and it's interesting. I come from Finland and oh my, if you could just see what kind of a food we sometimes have... You would be shocked. I'll definitely send you a photo when I arrive from my summer vacation! Hi Veg, great blog, it's really fun to read! I love how you point out, "The lady on the radio said I had a choice everyday of mini tomatoes and watercress, but I have never seen them." Shame about the hair, hope that's the last of them! Veg ! The hair on your plate represents the school dinner lady loves you very much! your blog ist realt great! Very interesting! I am from Hong Kong.Our E-learning programme has a passage about you and it give me this link!Your story is great.I will keep on checking your blog.